The bluebonnet is the state flower of Texas, thanks to the vast fields of bluebonnets that bloom each spring throughout the central portion of Texas. The flower gets its name from the shape of the petals, which look like bonnets worn by pioneer women. The petals of the pea-like flower are a gorgeous bright blue color and have a white tip. Over the years, the wild population has been supplemented with planted parcels of these beautiful bluebonnets. During the springtime, fields of bluebonnets can be spotted throughout Central, East, and Southeastern Texas. Many of the state's major highways are lined with bluebonnets and other wildflowers during this time of year, making for memorable scenic drives. In fact, some of the best-known stretches of highway for viewing bluebonnets in Texas are located in Washington County, which also includes Brenham, home to the popular Blue Bell Ice Cream. 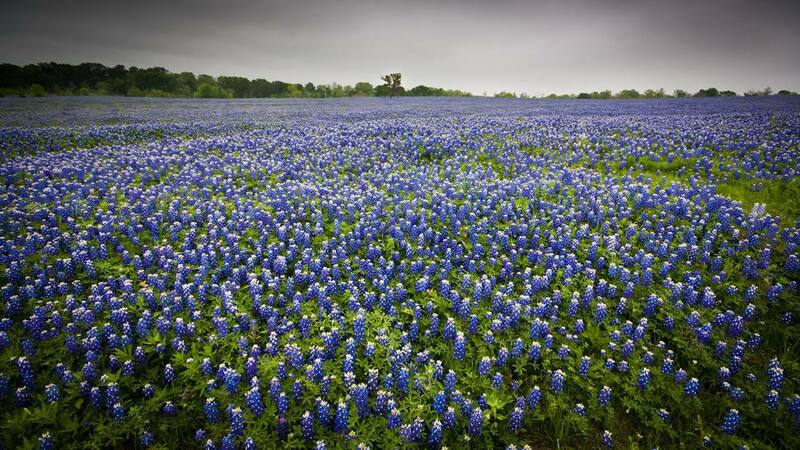 If your sole purpose is to see sprawling fields of blooming bluebonnets, the Texas Hill Country area is the place to be. There are a number of wild fields and farms in the region to visit, and families will love exploring towns like Fredericksburg, Wimberley, Kerrville, Burnet, Marble Falls, Llano, and Kingsland, which all have bluebonnet festivals or trails during the spring. The popular Wildseed Wildflower Farm in Fredericksburg is another great place to stop at with its amazing display of bluebonnets and other blooming wildflowers. Besides being the heart of bluebonnet territory, Texas Hill Country is also one of the state's most popular vacation regions—it encompasses major cities like Austin and San Antonio, but also the remote countryside. With so much ground to cover, many visitors choose to spend an entire weekend or longer here. Most travelers set out in a different direction each day to take in the sights and drive down one of the many scenic Hill Country roads and highways. Wine connoisseurs will enjoy the many numerous wineries nearby which offer tours and tastings. There are also boutique shops throughout the area that give visitors a chance to stop and stretch for a bit. Texas Hill Country is a vast region, and it's filled with a number of accommodations from hotels to ranches to B&Bs. Sage Hill Inn & Spa: This 16-room boutique B&B near Wimberley (and just 20 minutes from Austin) sits on 90 beautiful acres of Hill Country land—with plenty of wildflowers, including bluebonnets. A delicious breakfast and dinner are included in the rate. Horseshoe Bay Resort: If you're traveling through Hill Country with your family, stay at Horsehoe Bay Resort on Lake LBJ. It's packed with fun activities from golf and tennis to jetskiing to arts and crafts. Lake Austin Spa Resort: If you want wellness to be a focus on your Texas Hill Country trip, check out the Lake Austin Spa Resort, a luxurious retreat with fitness classes, a world-class spa, and healthy eats. There are plenty of options to choose from when it comes to dining in the Texas Hill Country. August E's: Located at 203 E. San Antonio St. in Fredericksburg, this American restaurant offers sushi and gluten-free options at a serious price point. Those looking for a superb fine dining experience will love the array of classic options like steak, lobster bisque, and quail, along with dessert favorites like creme brulee. Little Gretel: Little Gretel over on 518 River Rd. in Boerne offers Czech, German, and other European food at a reasonable price point. Those stopping by can enjoy delicious Sunday breakfast or brunch with eggs benedict, french toast, sausage platters, dumplings, and more. This restaurant on the banks of Cibolo Creek is great for those looking for food and ambiance. Redbud Cafe & Pub: This vegetarian-friendly American cafe over at 410 4th St. in Blanco has affordable and diverse items like soups, burgers, and fish tacos. People love coming here for the food, cold beer, and live music. Hill Country Bbq: This cheap eat is located at 27004 Highway 6 in Hempstead and a popular spot for barbecue. Travelers will be able to enjoy briskets, potato salad, barbecue sandwiches, and more.